“As a mobility provider, we will collaborate on sustainable solutions that supplement the transportation system in a way that makes sense, particularly in inner city areas. For this reason, we are launching the FordPass bike sharing service together with Germany’s market leader, Call a Bike,” said Steven Armstrong, group vice president and president, Europe, Middle East & Africa, Ford Motor Company, announcing the partnership at New Mobility World, the forum on future mobility at the International Motor Show (IAA) in Frankfurt. Customers will be able to use the FordPass mobile app to register for Call a Bike, find the nearest available bicycle, and pay for it online. The FordPass app can already be used to access Ford‘s car sharing service, to locate parking spaces, or find the lowest fuel prices at nearby garages. 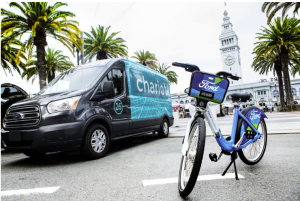 Ford and Deutsche Bahn Connect have since 2013 collaborated on a car sharing service, and in August this year, Ford announced 100,000 free one-year Call a Bike memberships for its customers.